Since the announcement of Apple's new augmented reality developer platform at WWDC in June, developers have been sharing interesting new AR experiences on iOS devices, including practical applications like measuring tape apps and basic character model demos. 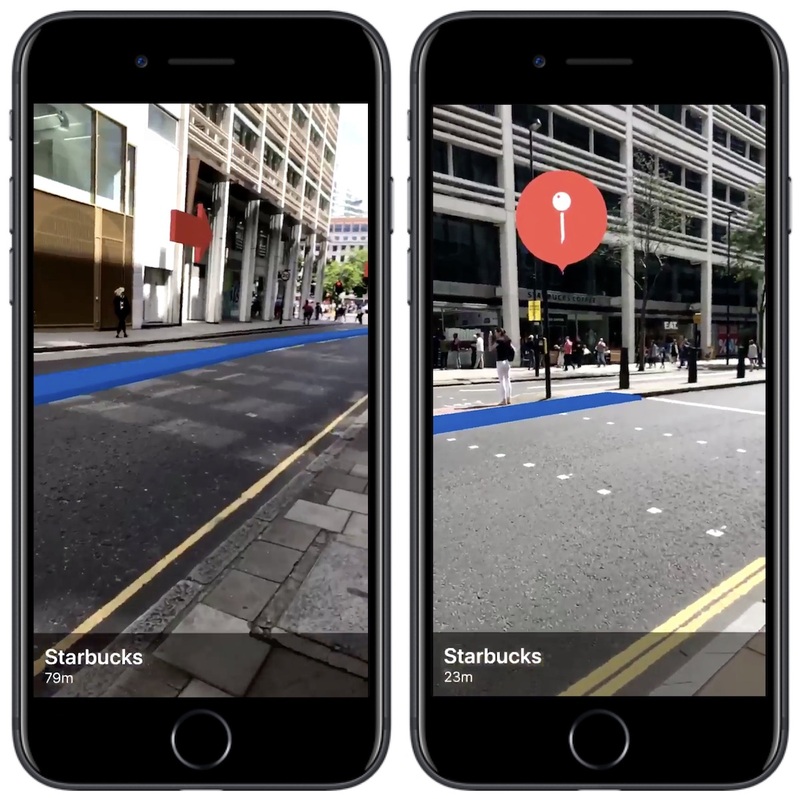 Today, we've rounded up the newest examples of how ARKit could work in real-world scenarios, starting off with a maps addition that could bolster directions in Apple Maps. As with all ARKit demos, today's examples are not confirmed to be the final launch products for augmented reality apps coming down the line, but they are intriguing glimpses into what users can expect when the AR features debut on iOS 11 this fall. Shared by iOS developer Andrew Hart on Twitter, the first example of the AR-enhanced maps software overlays destinations on points of interest when looked at through the camera of your iPhone or iPad, giving an estimation of how far you are from each location. Burrowing deeper into getting directions to a specific location, Hart used ARKit and Apple developer framework Core Location -- which lets developers integrate the geographic location and orientation of a device directly into their software -- to create augmented reality turn-by-turn directions. Acquisitions of mapping companies and patent filings dating back to 2009 have long suggested that Apple is interested in adding AR features into Apple Maps, but the technology prior to ARKit has likely not been promising enough for such an implementation. Continuing on the measuring AR app trend, a new tool was shared on the Made With ARKit Twitter account recently, allowing users to perform precise square foot measurements of an entire room. The last few measuring apps detailed in our ARKit roundup in June centered upon AR-enabled measuring tapes that could only provide distance estimates in a straight line. For those interested in gaming AR apps, developer Kobi Snir shared a real-life version of Pac-Man that uses ARKit to place users directly within the game's maze, filled with dots and ghosts. The players take on the role of Pac-Man, and move around the maze to eat every dot while avoiding the ghosts. Another recent gaming-related ARKit example showcased what Minecraft would look like in the real world. Games have been a core part of ARKit from the day it was announced, with Apple's senior vice president of Software Engineering Craig Federighi touting Pokémon Go as one of the first apps that will receive ARKit-related enhancements this fall. "The Pokémon is so real, he's right there on the ground," Federighi said at WWDC. "As the ball bounces, it actually bounces right there in the real environment. It's AR like you've never seen it before." Of course, these are just a handful of recent examples of ARKit that developers have shared. Others include a graffiti doodling app, a shopping app (similar to IKEA's planned ARKit app), and an inter-dimensional portal. Apple CEO Tim Cook has said AR makes him so excited that he just wants to "yell out and scream," telling Bloomberg Businessweek last month that, "When people begin to see what’s possible, it’s going to get them very excited—like we are, like we’ve been." It's not even released, and it keeps impressing! Easy to see why Tim is so high on AR. Here's hoping there are some significant breakthroughs in battery tech. The increased demands AR will place on mobile device batteries (and their always-on screens) is going to make us all long for the days when we got a full day on one charge. That's cool but I also find something hilarious about it. Can't people look for the Starbucks sign and, you know, walk toward it? How did we ever find anything before this! I don't get why people need cars when they can just ride a horse somewhere. Why go to the grocery store when you can just forage in the woods? Hell, why use language at all when you can just utter emotive sounds? Bravo! there are some amazing freaking things happening with ARKit today. Just think of all the apps that will come out over the next year! and beyond. That measuring app looks awesome. Cute...very cute with that pac man. Just know that when you get caught by the those colorful ghosts, you know that's the end of your life permanently because you didn't pay attention to the road and didn't hear the incoming cars coming toward you. Wow, very impressive stuff. Especially when you consider it's only been out for like a month. I consider these more like demonstrations than anything, but they show what is possible.